Dressed in a formal tie that dangles off of his long-stemmed neck, he rests comfortably in rich potting soil packed neatly inside a sturdy flower pot as his trusty assistant, Nina the Goat, pushes him about the city on a skateboard to solve “Big Deal” mysteries. Together Inspector Flytrap and Nina experience all types of adventures. As sharp-witted Flytrap investigates mysterious mucous blobs that have landed on expensive paintings, helps a giant peg-legged pirate find his misplaced shoe, and discovers the source of the stinky smell coming from a cookie-baking Dodo bird’s cookie shop, Nina the Goat maneuvers his skateboard from location to location— including through congested traffic, often eating everything in her path in the process. This clever little book will have readers smiling from the cover to the very last page. The book’s premise is tickle-bone funny: a Venus Flytrap with a cavernous mouth, a spaghetti-thin neck and crab-like eyes with a goat assistant who is just as likely to eat the agency telephone as she is to answer it. There is also a host of satellite characters, including Dodo bird bakers, sloths reading newspapers, and emus driving buses full of pigs who just happen to be art scientists. The artist who manages to capture all of this chaotic hilarity is Newbery Honor Award winner Cece Bell—who also happens to be the author’s wife. 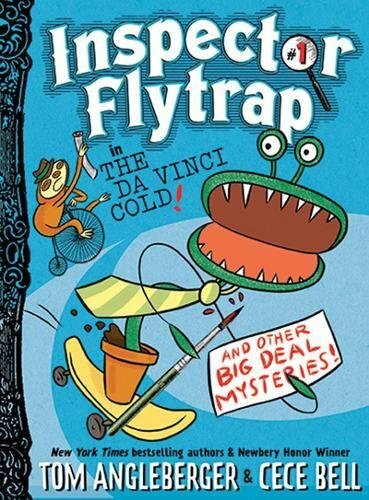 Young readers will love turning pages to see goats eating recipe books and cans, pirates searching for stinky shoes, penguin chefs cooking tasty linguini, and the always-clever Inspector Flytrap, who relishes a meal of scrumptious dead flies almost as much as he loves solving mysteries. This one is great for young independent readers.